PENN SURFMASTER 750 OR 70???? Im in a dilema, the 750 or the 70,? My mate has a couple of the 750's. They seem rugged enough but personally I wouldn't have one or the 70 because they have made the spool skirts too shallow and it's too easy to get your line trapped underneath, especially in the dark. It has happened to my mate several times with the resulting crack off when he tries a power cast. What is the best fixed spool around at the mo then, for big casting? I use an Okuma Silvara and they are great. I can get 150yards no problem with mine. Mine cost me 29.99 from my local tackel shop but if you shop around on ebay you might get it cheaper. From personal experience I like Okumas and Diawas but here again you need to be careful. The cheap end Okumas with one possible exception are not that wonderful and some of the Diawas although very good casters because of their wide spools also have shallow spool skirts or virtually nothing at all. 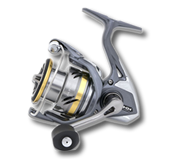 Right now if I had the money I think I would go for an Okuma Epix Pro.